As a waste disposal company serving Leicestershire, we keep up to date with all the local authorities in the County and how changes to waste disposal develop. There are big changes coming to the way waste is collected for those in Hinckley and Bosworth. Hinckley and Bosworth residents are seeing changes in local Council waste disposal services, including recycling measures, a new contract, and lowered bulky item fees aimed at reducing fly-tipping. The big change impacting all residents is the elimination of recycling caddies for dry waste. 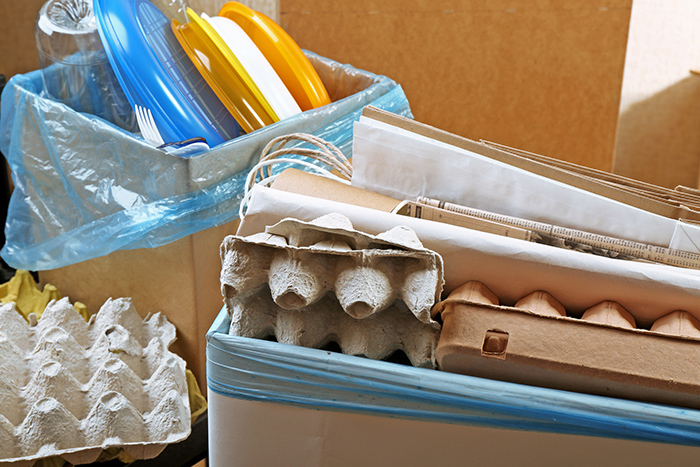 Dry items such as paper, glass, cardboard and recyclable plastic can be combined in the main bin. Council member Mike Hall says residents will benefit from the policy taking effect on April 1. “People will be able to put all their recyclable materials into the recycling bin and not worry about the caddy,” he said. Mr. Hall also confirmed that the old caddies will be picked up. Most residents will find this change in recyclables collection to be a convenience, but other waste disposal efforts have met with issues. Residents attempting to dispose of waste responsibly have found their local waste disposal site unavailable or “full” during working hours. The practices which result in refusing public disposal requests at a seemingly open site are causing complaints. Also beginning April 1, new charges go into effect for bulky waste items collected by the Council. The new rate is only £15 for pickup and disposal of three bulky waste items, lowered to £7 for those receiving benefits. The new fees are to help stem a recent increase in fly-tipping. The Council lowered the fee to encourage responsible waste disposal using legally recognized carriers. Bulky waste collection formerly cost £23.40 for three items—up to five items were priced at £25, with £6 more for each additional item. Fly-tipping has increased by almost 60 percent since controversial new fees were enacted last year by Leicestershire County Council. The rash of illegal tipping has littered area roads and landscape with everything from household rubbish to building rubble. Cleanup of fly-tipped sites cost borough taxpayers a recorded £35,532 for the period between April 2016 and March 2017. Annually between 2013 and 2016 the average cost had been £20,666—almost £15,000 less than fly-tipping expenses were last year. The Council moved to condemn “louts” and crack down with promised enforcement and additional scrutiny. Efforts are also afoot to implement a penalty of £400 for not using a registered waste carrier for disposal, responding to the surge in unlicensed operators who fly-tip the remains. Citing a recent cost comparison and tender procurement review, the Hinckley and Bosworth Borough Council confirmed a new seven-year contract with Supplier Specialists Fleet Services (SFS). Beginning September 1, the arrangement helps manage their aging fleet with the usage of additional Refuse Collection Vehicles, including sweepers, hook loaders and box vans.